Hey guys, KOOP is doing a special weekend of programming, which is pretty cool, so the Mascot Wedding Show will be off the air this Saturday. However, the awesome folks at ColdTowne Theater are letting us do a podcast recording in front of (drum roll) hopefully you. Plus, we’ll have some amazing guests Sean Patton (Conan, Late Night with Jimmy Fallon) and Josh Gondelman (Winner 2010 Laughing Skull Comedy Festival). Expect some hot talk, grousing, bits, and a busload of laffs. Come on out and be a part of The Mascot Wedding Show, “one of Austin’s best exports” (CultureMap Austin). Doors at 5:45, recording at 6PM. Pay What You Want BYOB. It snuck up on us, but this Saturday’s show is our 200th broadcast. To celebrate, we’re going to have a live studio audience during the show. If you’d like to be in the audience, send an email to mascotwedding(at)gmail(dot)com and we’ll hook you up (space allowing). Thanks! Posted on January 4, 2012 Author Mac BlakeCategories Neurontin high, Cheap cialis from ukLeave a comment on Mascot Wedding’s 200th Broadcast! “Why are the podcasts so backed up?” I know, I’m a monster. My problem with time management exists because I have a hard time saying no to fun projects. When Josh Krilov, the artistic director at ColdTowne Theater, offered Mascot Wedding a monthly live show to do whatever we wanted with, I had the hardest of times sayign no to that. You might say impossibly hard, because we said yes in a heartbeat. Maybe two or three. I’m not the fastest typist. For example, I started this paragraph three hours ago. Guys, I’m super excited to tell you about The Hustle Show. The Hustle Show is a modern variety show, featuring sketch, stand-up, music, games, and more. Our pilot episode is this Thursday. If people like it, it will continue the second Thursday of every month. What have we got for you? A sketch from Hot Property! A musical appearance from David Lee Hess and Cody Dearing! An interview with a failed TV talk show host! A performance by the Austin Police Department Drama Club! A Christmas Carol featuring Andrew Rosas from Ghostward! It’s going to be a great show. We have a murderer’s row of Austin comedy types in our cast. Katie Sicking, Michael Pedicano, Ashley Franks, David McQuary, Scott Raney, Courtney Sevener, and Jeff Whitaker. Hosted by David Jara and myself. All for the no excuses price of $5. Hope to see you there. 10PM Thursday, Dec 8 @ ColdTowne Theater $5 BYOB. Tix here. KOOP’s Fall 2K11 Membership Drive is upon. The first show last week went great and we’re looking to step it up this week. A membership pledge gets you our Come and Make it shirt. And this week – the first two sustainer pledges gets you enrolled at a Level 1 improv or sketch class at ColdTowne Theater. Listen today at 6PM CST and call 512-472-KOOP or pledge online at koop.org. Thanks! OH YEAH AND there’s some live Mascot Wedding action happening tonight. Stag Comedy Episode 4: The Sweaty Meringue! You guys knows about Stag Comedy right? Of course you do. You know it’s the sketch comedy project from Mascot Wedding Productions and features the full MW crew along some super talented friends, including members of Master Pancake Theater. I know you check the stagcomedy.com or the Facebook or the twitter, so it’s probably super redundant to tell you that Stag Comedy’s all-new sketch revue Episode 4: The Sweaty Meringue will wrap up it’s two week run at the Alamo Drafthouse Ritz tomorrow, Sunday July 10th at 7PM. The Sweaty Meringue is a mix of live and video sketches featuring tales of violent lawyers, street gangs, dino-ducks, helpful wrestlers, prophylactic icons, and more. Joining Stag Comedy on stage are the femme fatales of the sketch group Rattlesnake. The last show sold-out and this will be the final performance of the full show so the sooner you buy tickets the better. See, you knew all that. I should just shut-up. See you tomorrow! Posted on July 9, 2011 July 9, 2011 Author Generic for cymbaltaCategories Buying generic lyrica, Neurontin highTags Ordering zithromax overnight deliveryLeave a comment on Stag Comedy Episode 4: The Sweaty Meringue! Episode 166: Super awesome show with super awesome guests Dan Telfer and Kerri Lendo! Some comedy talk, in your face dinosaur talk, Friday Night Lights, the Ladies Are Funny Festival, and David finds out something shocking from his birth certificate. This Saturday is our final show of Membership Drive, which means its your last chance to support The Mascot Wedding Show! A pledge of at least $25 will get you the Winning Time Fun Pack which includes a MW pennant (design pictured above), a CD with original material, and more. Call in or pledge online tomorrow (Saturday), during our show, 6-7PM CST. That’s 472-5667 or toll free 1-888-917-5667. But you must do it during our show. Thanks in advance. Super thanks. BTW: Everyone who pledged during our last two membership drives will also be getting the pennant. UPDATE: We will not be broadcasting the Mascot Wedding Show from Staple. We’ll be in-studio taking your pledges for our final show of membership drive! 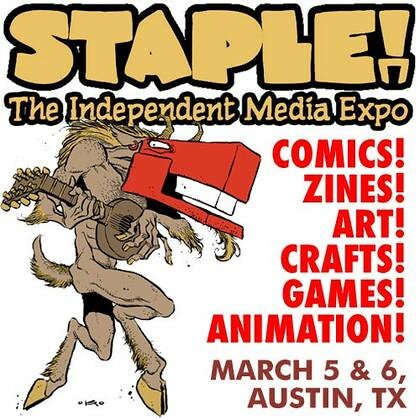 We will still be tabling at Staple though, so come ut and say hi. Hot Property is sketch-prov. That means we sort of write it out but not really and we sort of make it up as we go but not really. Before you judge us as just a lazy sketch comedy group, we need to catch our breath first. And maybe lay down. Hot Property is Mac and David from MW plus Nick and Lance of Midnight Society. Your Terrific Neighbors are your sketch comedy headliners. A monthly stand-up showcase hosted by David McQuary, who is one of the best kids ever. Come see a bunch of funny people and also Mac. This isn’t really a live event, but the sketch comedy arm of Mascot Wedding, Stag Comedy, is going to start uploading a new video every Wednesday. Starting today! Head to stagcomedy.com to check’em out. Of course you got the Mascot Wedding Show today (with special guest Chris Nicholas from Staple!) 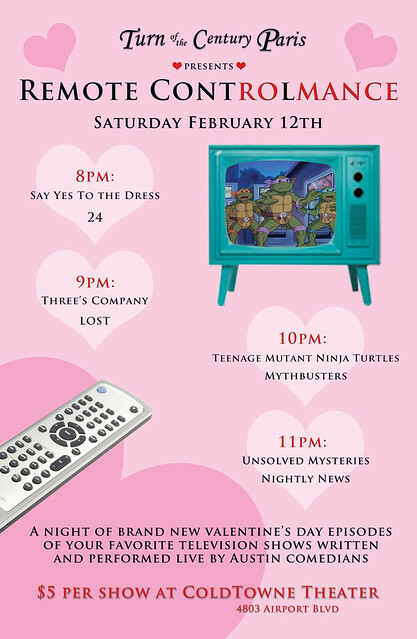 but then later tonight, Hot Property (David, Mac + Nick and Lance from Midnight Society) will be doing some sketch comedy as part of Remote Controlmance, a sketch showcase featuring Valentine’s Day episodes (that never existed) of a bevy of TV shows. Hot Property will be doing a special V-day local news broadcast. The news hits at 11PM Coldtowne Theater. $5, BYOB.